I am feeling a little late to the party on this popular trilogy, but I'm glad I finally picked it up. I was instantly hooked by this world and its characters. Alina Starkov is an orphan recently drafted into the Army with her life-long, best friend Mal. Both were orphaned by the war that has ravaged their homeland for centuries. When the pair are sent on a mission into the dangerous and frightening Fold, a spread of unnatural darkness full of man-eating Volcra, Alina is convinced they will not make it out alive. But they do make it out. Barely. And it’s all because it turns out Alina is not what she thought she was. Suddenly, she is taken to the royal court to be trained as the Grisha— a magical, elite group of people led by The Darkling. But Alina’s time with the Grisha is confusing. What is her purpose? Who can she trust? Who is her friend and who is her enemy?And most of all, will she see Mal again? I loved this read. Yes, it follows some of the patterns that are common in dystopian and YA fantasy fictions, but this book was not “thick” with those cliches, and I found myself more lost in the story than anticipating common patterns. Not to mention I don't feel like I can call anything. Bardugo surprised and stumped me. I love Alina. She is a good balance of surly and hilarious, with just enough a stubborn in her to move the story along in good ways. I am intrigued with the Darkling. I have many suspicions about him, but he remains a mystery. I like being so unsure about him. (or in love with him. I can’t tell yet.) 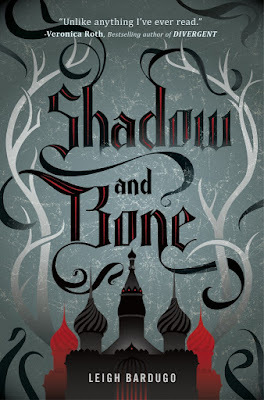 I loved the world that Bardugo created and her characters, and am super intrigued by how these story lines will unfold! Also love the incorporation of Russian folk/fairytales. This isn't a retelling, it just incorporates them into the storyline. Keeping my fingers crossed that Baba Yaga shows up. ha.